What one man can do? How many times have you heard that an individual can’t make a difference? How many times the tales of the crusaders been ridiculed by the masses as leap of fortune not worth emulating. Yet contradictions to conventions keep springing to the surface mocking the agnostics. No two snowflakes are alike; we all can be the catalysts of change if only we believe. Here is an interesting story(Starfish Story) I read in ”Star Thrower,” a collection of essays by the naturalist and writer Loren Eiseley 1978. ‘Son,’ the man said, ‘don’t you realize there are miles and miles of beach and hundreds of starfish? So next time when some one asks why sow in a sapling, it can’t contain pollution or when someone asks why caress a stray, they can’t all be adopted… you know what to believe in. May you be the difference! Before I part, I would like to share with you this clip featuring the Crocodile Hunter ‘Steve Irwin’ with background score from John Denver. 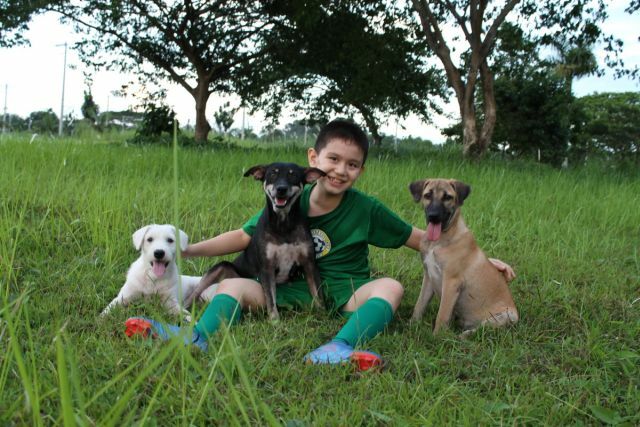 Drawing parallels to this story, a 9-year-old kid from Philippines has established a dog shelter of his very own right out of his dad’s garage. 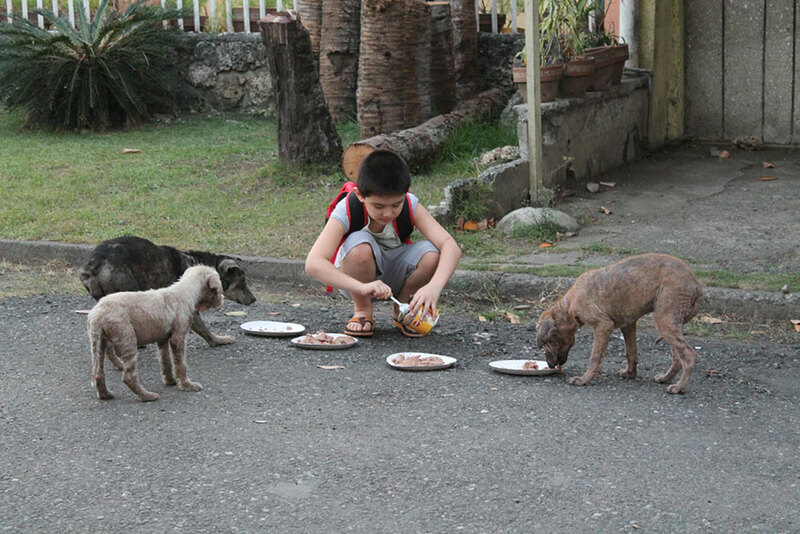 Nine year old Ken with the stray dogs he takes care of. Ken may be a young kid but he knows what it means to be a human in true essence. Ever since pictures of him feeding stray dogs went viral in February, strangers from all over the world have helped him achieve his dream of establishing a no-kill animal shelter – Happy Animals Club. He is helping stray dogs on the street recover from their many diseases and illnesses and hopefully find a loving home. Still wondering what one man can do? U are very much welcome, Kaalicharan. Guess the old world story from Aesop’s fables need to be retold again. The power of ONE good deed resonates forever. Still awaiting for more of your pics for the Dog Book. That was an amazing story, Calvy! And soo very true. It’s each drop that makes an ocean. And so also, just one gesture makes the whole difference between ‘doing’ and ‘not doing’ a good deed. Thanks Punam:) The difference is always made by crossing that thin fine line of idea and corresponding action. Amazing story to put across the point . Super Like! What a nice blog – we loved the story of the starfish. We kinda feel like that about dogs – you can’t make a difference for them all but you can for one dog – well in our case two! I remember watching that video about the starfish at a seminar. One man can indeed make a difference. Lovely write up! Previous Previous post: The World’s Cutest Best Man! Next Next post: ‘Just a dog poem’ & Johnny Depp’s absolutely awesome speech!